Halfway through dinner at Evvia, a bustling Greek restaurant in downtown Palo Alto that Apple cofounder Steve Jobs used to frequent, Jen-Hsun “Jensen” Huang rolls up his shirtsleeve to show me his tattoo. It’s tribal in style, with thick curves extending across his shoulder cap. The black ink gleams in the warm glow of the restaurant’s low lights. Huang’s two adult children, speakeasy proprietor ?Spencer and hospitality professional Madison, also have tattoos. But at 54, their father, cofounder and CEO of the red-hot Silicon Valley semiconductor and software company Nvidia (NVDA, +1.20%), so far has only this one, an abstract version of the company’s logo. He got it about a decade ago. Most Fortune 500 CEOs over 50 don’t have tattoos, let alone of the logos of the companies they run. But Huang, who was born in Taiwan, isn’t most Fortune 500 CEOs. For starters, he’s the rare cofounder still running his company 24 years later. He is both a trained electrical engineer (Oregon State; Stanford), and a formidable executive who leads employees with encouragement, inquiry, and often flurries of vacation emails. (Sent during his, not theirs.) And he is, according to many people in the industry, a visionary who foresaw a blossoming market for a new kind of computing early enough to reposition his company years in advance. That vision and his company’s incredible financial performance make Huang the clear choice as Fortune’s Businessperson of the Year for 2017. 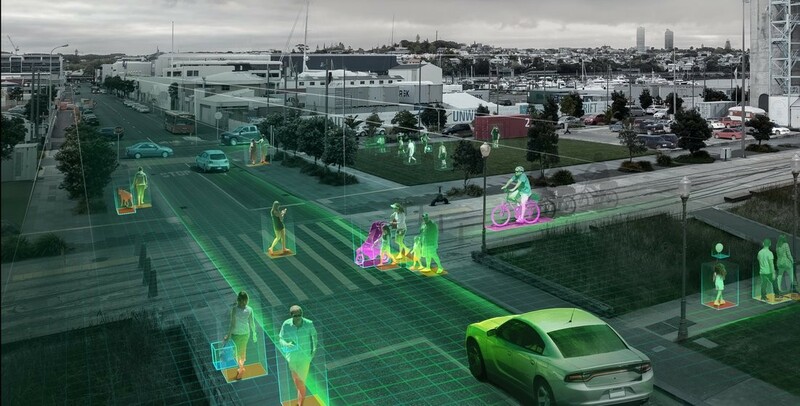 “Jeff Bezos, Elon Musk—I put Jensen in that group,” says Todd Mostak, CEO of MapD, a San Francisco database company in which Nvidia has thrice invested. If you haven’t heard of Nvidia, you can be forgiven. It doesn’t make a chat app or a search service or another kind of technology meant to appeal to the average smartphone-toting consumer. No, Nvidia makes the muscular mystery stuff that powers all of it. 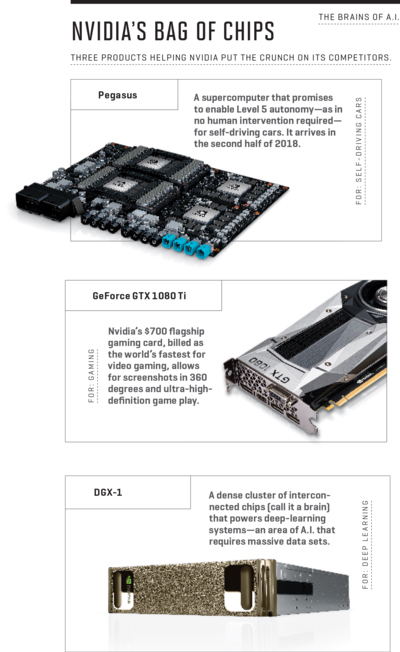 Its GPUs, or “graphics processing units,” crunch the complex calculations necessary for cryptocurrency markets, so-called deep neural networks, and the visual fireworks you see on the big screen. The same technology that makes brutally realistic shooter games come alive helps self-driving cars take an “S” curve without assistance—enabling computers to see, hear, understand, and learn. 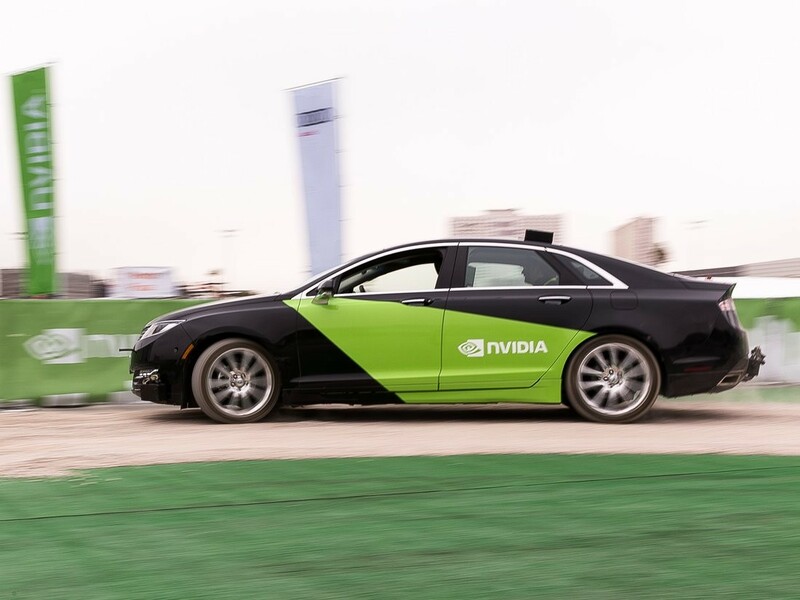 Booming demand for its products has supercharged growth at Nvidia. Over the past three full fiscal years, it has increased sales by an average of 19% and profits by an astonishing 56% annually. In early November the company reported results that once again blew past Wall Street’s estimates, with earnings per share 24% higher than expected. In its past four quarters, it has generated total sales of $9 billion and profits of $2.6 billion. Such results have made Huang’s company a darling of investors. Nvidia’s share price, just two years ago hovering around $30, was recently over $200. Its market capitalization, at about $130 billion, is approaching that of IBM (IBM, +1.37%) and McDonald’s (MCD, +0.32%). Battling with the world’s biggest tech companies for A.I. supremacy was far from Jensen Huang’s mind when he cofounded Nvidia with friends Chris Malachowsky and Curtis Priem in 1993. At the time, Malachowsky and Priem were engineers at Sun Microsystems, and Huang was a director at San Jose chipmaker LSI Logic. Malachowsky and Priem had lost a political battle within Sun over the direction of its technological development and were itching to leave. Huang, just 29 years old, was on firmer ground. The three men met at a Denny’s restaurant near Huang’s home to discuss what they believed was the proper direction for the next wave of computing: accelerated, or graphics-based, computing. Huang walked away from the meal with enough conviction to leave his position at LSI. With $40,000 in the bank, Nvidia was born. The company initially had no name. “We couldn’t think of one, so we named all of our files NV, as in ‘next version,’?” Huang says. A need to incorporate the company prompted the cofounders to review all words with those two letters, leading them to “invidia,” the Latin word for “envy.” It stuck. Nvidia’s first product, a multimedia card for personal computers called NV1, arrived in 1995 at a time when three-dimensional games began to gain traction. The card didn’t sell well, but the company kept tinkering with its technology over four more releases, gaining sales—and traction vs. rivals 3dfx, ATi, and S3—each time. A successful IPO on the Nasdaq in 1999 set in motion a flurry of milestones for Nvidia. That year it released the GeForce 256, billed as the world’s first GPU. In 2006 it introduced CUDA, a parallel computing architecture that allowed researchers to run extremely complex exercises on thousands of GPUs, taking the chips out of the sole realm of video games and making them accessible for all types of computing. In 2014, the company revived a failing bid for the smartphone business by repositioning those chips, called Tegra, for automotive use. 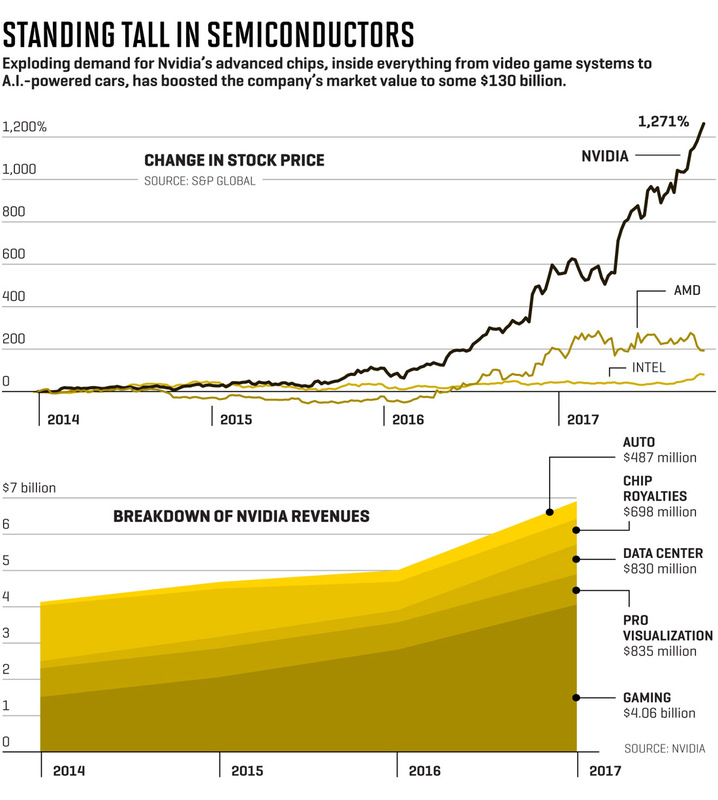 Over time, these moves proved prescient, unlocking new revenue streams for Nvidia in industries such as defense, energy, finance, health care, manufacturing, and security. Key to Nvidia’s ability to endure years of market doubt, Lebaredian adds, is Huang—a leader with deep conviction in the potential of graphics technology and an ability to think in 10-year time horizons. Dozens of people patiently stand outside awaiting the grand opening of Endeavor, Nvidia’s massive new headquarters in Santa Clara, Calif. The 500,000-square-foot structure is nothing less than imposing. A triangular foil to Apple’s circular new headquarters six miles away—its shape is drawn from the building block of computer graphics, the triangle—Endeavor’s glassy facade rises up over the San Tomas Expressway like the bow of a starship coming into port. Unofficially, Endeavor has been open for a month, allowing more than 2,000 employees to acclimate to its tree-house-like structure. (Staffers enter from an underground parking garage and ascend at its center.) Today some 8,000 people are expected to stream through the doors for an open house for employees and their families. There are stations prepped with lines of finger food and beverages. Face painters await an inevitable onslaught of children. The smell of sawdust and paint lingers in the halls. Inside, triangles abound. Floor tiles, privacy screens, lobby couches, window decals, skylights, cafeteria counters, even cross braces for the structure itself—all in shapes with three points. In a continuation of the theme set by Endeavor’s name, the building is bursting with rooms nodding to science fiction: Altair IV, Skaro, Skynet, Vogsphere, Hoth, Mordor. Huang doesn’t keep an office, preferring to move around the building nomad-like, setting up shop in a variety of conference rooms. When Fortune visits, he’s taken up temporary residence in one called Metropolis, after the 1927 silent film—but the CEO is not present. A container stuffed with Clif Bars rests at the center of the table. Rolls of blueprints lie across a chair to the side. When I finally locate Huang, he is wearing his signature leather moto jacket and nibbling on breaded chicken strips from a cup as he strides across the sprawling cafeteria with at least two dozen employees and their families in tow. At Huang’s side are his wife, Lori, as well as his son and daughter, who flew in from Taipei and Paris, respectively, to surprise their father. The CEO is apparently in a bind. He is trying, but failing, to complete a design review of Endeavor that was scheduled before the doors opened. But he’s already inundated with guests seeking handshakes and selfies, and he can’t resist a single one. Huang will repeat a version of this exchange hundreds of times during the open house, sometimes with handshakes, sometimes with hugs. Indeed, over the course of four hours, the CEO sits only once, for a photo with a young girl who resists her mother’s calls for a smile. (In a fatherly feat, Huang manages to wring one out of her.) The line to greet him never subsides. The spectacle is a vivid example of what many former and current Nvidia employees say is the company’s secret sauce: its culture. For a publicly traded technology company with more than 11,000 employees, Nvidia is surprisingly tight-knit. It’s a credit to the many long-serving staffers who remain at the company (badge numbers are issued in serial; the lower the number, the longer the tenure) and the business battles they’ve endured together. It’s also the product of a founder CEO who embraces community, strategic alignment, and a core value system that promotes the pursuit of excellence through intellectual honesty. The scientific pursuit of truth resonates at all levels of the company, employees say, helping tamp down on the organizational politics that obstruct other companies’ progress. Nvidia’s CEO takes off his wire-rimmed glasses and rubs his bloodshot eyes, fatigued after hours of slapping backs and pumping palms. He plops down at a wooden table where his wife and two kids are seated as the last of the open house attendees exit the building. Staffers working the event begin to sweep up the area around him, picking up plastic cups, wiping surfaces, arranging chairs. His security guards stand alert. Huang leans toward me and asks me to pose the questions I had intended to get to earlier, when he was still busy working the rope line. I ask him what he believes is the next major application of artificial intelligence technology—the next billion-dollar opportunity for Nvidia, category competitors like Intel and Qualcomm (QCOM, +0.76%), and players like Google (GOOGL, +1.13%), Facebook (FB, +0.92%), and Baidu. “The thing that I believe is going to be really incredible that’s going to happen next is the ability for artificial intelligence to write artificial intelligence by itself,” he replies. By now my head is spinning, lost in a bizarre vision that somehow combines the films Office Space, The Matrix, and Inception. Suddenly, a massive thud rips through the room, followed by the clatter of plastic cups. The space falls to a hush and Huang pauses, losing his train of thought. In one corner, two employees with overfilled arms had been precariously juggling the remnants of the wine and beer station. Gravity won. It’s merely more evidence of Huang’s ability to see into the future. A version of this article appears in the Dec. 1, 2017 issue of Fortune.